"You become your job. I am a hustler. Even when I'm not hustling, I'm a hustler. What you do is what you are. I don't think it's so terribly different than someone who works on an assembly line for 40 hours a week and then comes home cut off, numb, dehumanized. People aren't built to turn on and off like water faucets." In 1974, Studs Turkel published what became his most popular work. Entitled Working: People Talk About What They Do All Day and How They Feel About What They Do, it presented the true-life stories of more than 100 Chicago working people, their stories taken from interviews with Turkel. His examination of every profession, from the prostitute, to the waitress, to the highly-paid business man, paints a critical portrait of the work climate in America, the way these people, the so-called privileged living in the wealthiest nation in the world, still feel unfulfilled, constrained, and limited by their jobs. In 1978, the book was translated into a Broadway musical by composer Stephen Schwartz, successfully capturing the pointed social criticisms of the book with both monologues and engaging, varied musical numbers from top songwriting talent, including James Taylor, Stephen Schwartz, Craig Carnelia, Mary Rodgers, and Susan Birkenhead. In 1982, Swartz, along with co-director Kirk Browning, adapted the material again, this time for television. 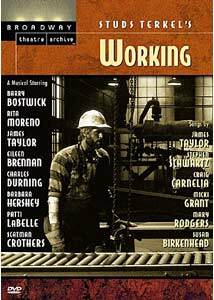 They elicited the help of such notable actors as songwriter Taylor, Barry Bostwick, Rita Moreno, Eileen Brennan, Charles Durning, Barbara Hershey, Patti LaBelle, and Scatman Crothers, retaining most of the Broadway material, but spicing it up with higher production values. The material remains as compelling as ever. The show is segmented into over 20 different sections, each examining a different profession, each told in the worker's own words. All are compelling, particularly the segment with Barbara Hershey as a high priced call girl, and others are surprisingly funny (a secretary who intentionally appears inept at her job just to annoy her patronizing boss). The best segments, however, are the ones featuring music—Working features probably the most underrated music of any Broadway musical in recent years. Particularly strong are tracks from James Taylor—Millwork, sung by a weathered woman working tedious hours at a factory, is a showstopper. Other strong numbers include the ensemble pieces Something to Point To and If I Could've Been, and the segment featuring Rita Moreno as a waitress who sees her job as a one woman show. Working is a show tinged with regret and the sadness of wasted promise. Many of the characters are matter of fact about their mundane jobs, the way they feel unappreciated and defeated. Turkel himself, introducing and providing transitions throughout, comments, "we've yet to find jobs big enough for our spirits," and, if nothing else, the show makes clear the importance of finding meaning and making a difference in the world, outside of whatever work you do. On Broadway and in most productions, sets were simple structures, wheeled on and off the stage, and the stark environments captured the emotional feelings of the characters. This version is more ambitious, using real locations, and though this probably works better from a visual standpoint, it takes away some of the directness and emotion of the piece. Likewise, montages, photos, ect, augment many segments. Somehow, these visual touches likewise distract from the potency of the material. Especially aggravating was the Millwork section, my favorite in the play, which is ripped of much of its emotional resonance when the actress playing the role doesn't perform her own song. Still, the music and writing is so powerful, that these changes don't make a significant difference. I can't be totally impartial here, as I appeared in an amateur high school production of Working a few years back (I played a fisherman, a role cut from this incarnation), but I still think it is safe to say that this is one rarely seen musical gem that deserves to be rediscovered. Image Transfer Review: The source material for this low-budget PBS production appears to have been a video master. As a result, it looks none too pleasing on DVD. The image is very, very soft with poor detail—it is somewhat difficult to make out faces except in close-up shots. Colors look dull and washed out. The image also appears rather unstable, as the image sometimes visibly wobbles a bit. The increased clarity of DVD also results in one really unfortunate looking scene using bluescreen effects. Overall, though, considering the source material and age of the film, I'd say it is very watchable. Audio Transfer Review: This 2.0 mix suffers badly from a lack of LFE support. I'm not talking about booming bass, just something to undercut the harshness of the music. Unfortunately, however, there isn't much, and as a result, the more bombastic musical numbers sometimes sound pretty over-modulated and rough. Dialogue likewise sounds a bit tinny, but it always clear. Once again, considering the source, this isn't too bad, but I wish the musical numbers sounded better. Extras Review: Extras specific to Working are limited to cast filmographies and a three-minute trailer that is really just the opening number, reworked into a promo. There's also some brief production notes included on the disc insert. However, the disc also includes an impressive collection of clips from other discs in the Broadway Theatre Archive series. Included are segments on Fifth of July, King Lear, Beyond the Horizon, Antigone, Alice in Wonderland, Ah, Wilderness!, Mourning becomes Electra, The Royal Family, Hamlet, The Iceman Cometh, The Seagull, and The Time of Your Life. Some are just brief TV spots, but some are full-blown featurettes running five minutes or more. Total running time for the trailer gallery is nearly an hour. Legendary Chicago author Stud's Turkel spoke at my school earlier this year, and someone asked him why he chose to focus his work on the everyday person rather than those more visible, like politicians and athletes. His reply echoes in both the book and musical versions of Working: he finds that ordinary people carry with them extraordinary dreams. This musical is a sometimes depressing, sometimes inspirational, and probably one of the most emotionally affecting stage productions I've ever seen. The filmed version loses something in the translation, but remains a powerful piece of theatre.